FROG Test Strips precisely measure chlorine or bromine levels at the low end of the scale – something ordinary test strips won’t do. Such accuracy is important since FROG Mineral Systems are designed to operate at just 0.5 parts per million of chlorine for pools or 1.0 part per million of bromine for spas. FROG Test Strips have the ease of dip and read. No swirling or shaking water off. The color matches are sharp and precise even at the low levels. 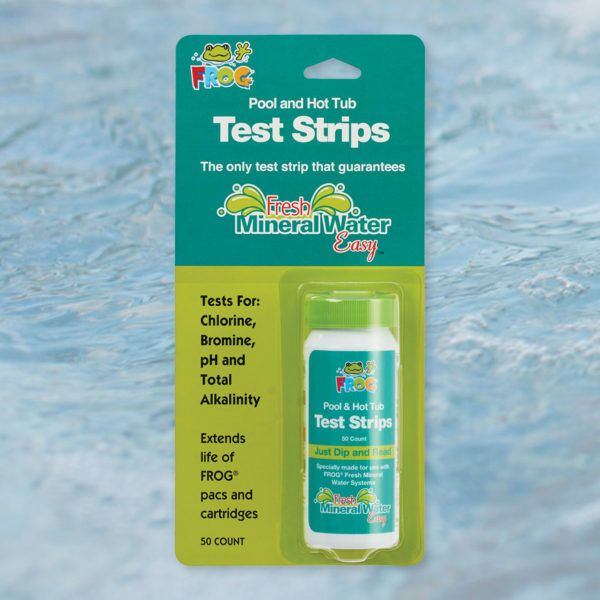 The best part is that FROG Test Strips show the ideal chlorine or bromine range when using FROG minerals right on the bottle. No guessing. No wondering. In 15 seconds, you can know precisely what level of chlorine or bromine is in the water, as well as whether your pH and Total Alkalinity are balanced. Simply dip the strip into the pool or spa water, hold the strip level with the water sitting on it for 15 seconds and then put it up to the color chart and compare. If you are in the ideal ranges as shown with the green arrows, then you are good to go! FROG Test Strips utilize the technology of Aqua Check – the most effective, highest selling test strips available in the world. While most test strips will say a 0.5 ppm chlorine level is too low for a pool, you have the confidence with FROG Test Strips that you are in the ideal range when using minerals.